Students Supporting Israel is a rapidly growing pro-Israel international campus movement that supports the State of Israel. Founded at the University of Minnesota in early 2012 by Ilan Sinelnikov and Valeria Chazin, it currently has multiple chapters across the United States and Canada. Our mission is to be a clear and confident pro-Israel voice on college campuses, and to support students in grassroots pro-Israel advocacy. We are committed to promoting a better understanding of Israel throughout North America as a member of the family of nations, with a fundamental right to exist as a Jewish, democratic state, within secure borders. We want to provide students on college campuses and universities with the opportunity to support the position of Israel in the Middle East, and to reassure students who opposed the demonization of the State of Israel on campus that they are not alone. We are changing the anti-Israel climate many students encounter on campus. By being part of a united, strong and thriving international movement, students are empowered to express their views in support of Israel. Our goals and activities include familiarizing students and the university community with current events in the Middle East, sharing Israeli culture on campus, and responding to bias anti-Israel propaganda when spread by other members of the academic community. We believe in sharing knowledge with students about Israel’s history, its diverse people, and its day to day reality, as Israel should not be looked at solely through the lens of conflict but as a nation with legitimate and unique story, values and aspirations. Students Supporting Israel is an independent, nonpartisan, grassroots campus movement that was created by students, for students, in order to organize a strong and united pro-Israel front on college campuses. We are made up of students from different political, religious, and ethnic backgrounds, all working together as Students Supporting Israel. We believe in grassroots action, and want to empower students who support Israel on campus to lead their fellow students and the campus community. 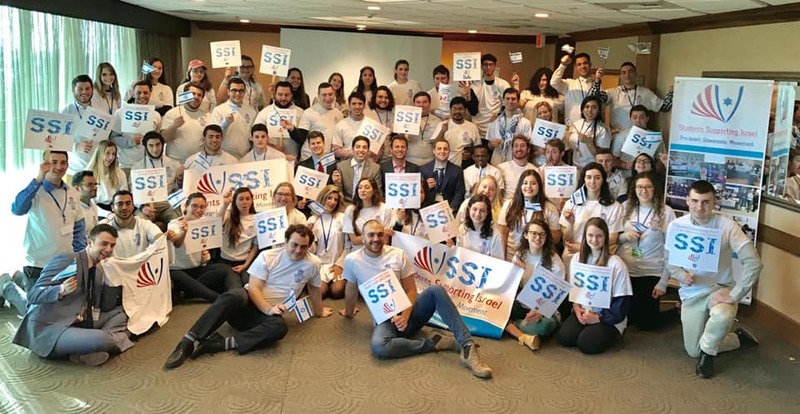 "I love SSI because we are a grassroots movement that promotes dialogue, diversity, and co-existence as Israel is the only democracy in the Middle East and her values are relevant to everyone. SSI is my "safe-space" where I can embrace my identity, and feel proud on campus. SSI is a leading group in the fight against campus antisemitism and I am proud to play a role in that. - Tamar Jaclyn Lyons, 4th President of Students Supporting Israel at Ryerson University (Toronto Canada). "Students Supporting Israel is great on campus because you don't need to be Jewish in order to be a part of SSI"
- Kevin Brum, 2nd President of Students Supporting Israel at UC Irvine. "I am Proud to represent Students Supporting Israel as someone who strives for dialogue, empathy, coexistence and a strong Jewish and Democratic State"
​- Nicole Gorelik, Founder of Students Supporting Israel at University of Wisconsin Milwaukee. 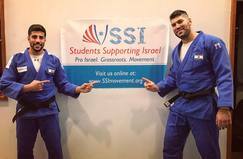 April 2017: Rio Olympics Medalist Ori Sasson and World Champion Medalist Golan Pollack came to Columbia for an Israeli Judo Night Event. March 2017: Tzipi Livni, a Knesset member and the Former Minister of Justice of Israel spoke at Columbia University. February 2017 : Israeli Ambassador to the UN Danny Danon spoke at Columbia University. 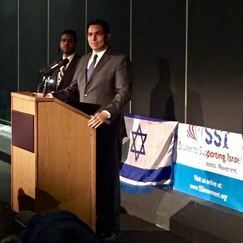 April 2015: Israel's Consulate to the Midwest chose SSI to receive the 2015 award for Outstanding Pro Israel Activism! 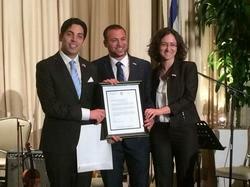 The award was received during Israel’s Independence Day celebrations! We are incredibly honored to receive this recognition - that belongs to all our Amazing SSI Leaders across North America who are on the ground and give Israel a voice on their campus! In the photo: SSI's Chairwomen, Valeria Chazin, SSI's President, Ilan Sinelnikov, and SSI's National Advisor, Naor Bitton, receiving the award in Chicago. 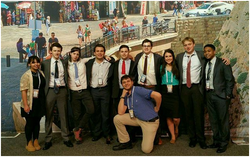 March 2015: Demon PAC - Students Supporting Israel at Depaul University were recognized as the student group activists of the year at the 2015 AIPAC policy conference! In the photo: the student leaders of SSI's DePaul University Chapter for the 2014/15 academic year. 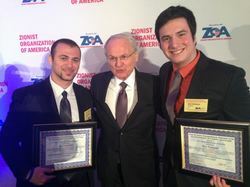 November 2014: Students Supporting Israel is the Winner of the Myron Zimmerman Award for Outstanding Campus Activism across North America. In the photo: Ron Feingold, SSI University of MN Chapter President for the 2014/15 academic year, and Ilan Sinelnikov, SSI's National President. 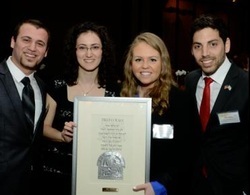 April 2014: Students Supporting Israel at the University of Minnesota, winner of CAMERA's David Bar-Ilan award for Outstanding Campus Activism for the academic year 2013-14! Presented by the Committee for Accuracy in Middle East Reporting in America (CAMERA) the award was received for establishing the SSI group on campus (SSI’s first chapter! ), and for becoming one of the most active groups on campuses throughout North America. The group’s activities included, among other things, organizing events, building a strong social media presence, forming coalitions with other student organization, and publishing articles in the local media and the university newspaper. In the photo: Ilan Sinelnikov, Valeria Chazin, Marta Slobodyanyuk, Naor Bitton. "Dear Aggie Students Supporting Israel and fellow members of the community. It is with great pleasure that I welcome you to the "Salsa Tel Aviv" Event. Israel has been the United States Strongest democratic ally in the Middle East ... I encourage you to stay active in your communities and to participate in events such as this, to spread the word on issues that are importance to you. I look forward to the continued success of ASSI and wish you the best in your future endeavors." 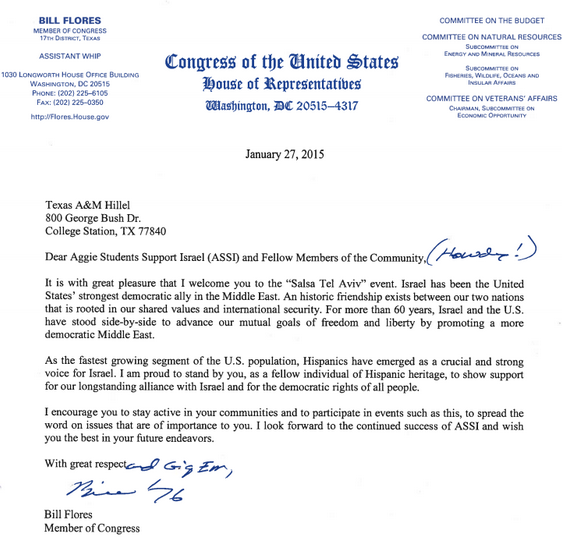 We thank U.S. Representative Bill Flores for the kind letter! We are happy to know that on Capitol Hill our representatives know about Students Supporting Israel! Students Supporting Israel is a non-profit 501(c)(3) organization. © 2015 Students Supporting Israel. All Rights Reserved.